Impact Hub, a co-working space that often hosts community events and workshops, opened its doors in February 2014. Since then, it has hosted several small business and start-up bootcamps, created the Omi Gallery for artist exhibitions, and helped Oakland youth launch successful businesses. Their office, a former car dealership, is in Uptown, a neighborhood that is quickly growing with new, pricier restaurants and residences. About 160 people gathered “On Broadway,” Impact Hub’s 3,300 square-foot open air space that can transform into a dance floor, spacious dining room, a performance space fit for an open mic night or a pop-up art gallery. The event featured “20×20 lightning presentations” in which representatives from five different community organizations spent 20 seconds sharing a total of 20 slides. During his presentation, Gino Pastori-Ng, Youth Hub Oakland’s co-director, announced Oakland Emerging 100, a program to “prepare, launch & grow” 100 entrepreneurs between the ages of 18 and 29 in Oakland annually, beginning in January, 2017. “It’s about getting institutions like the City [of Oakland] involved that have traditionally disenfranchised young people of color and actually recognizing that they have value and getting the city to invest in that,” he said. According to Pastori-Ng, Oakland Emerging 100 is the group’s biggest initiative to date. The program is supported by the city government and Youth Business USA. 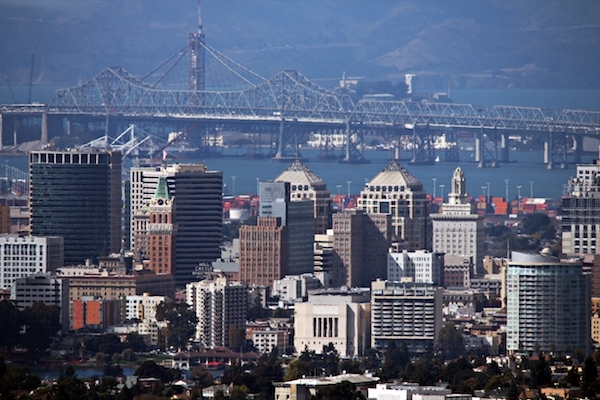 Impact Hub Oakland will host the program’s public launch on December 8. Artist Binta Ayofemi presented two forthcoming projects. This fall, Ayofemi will work with Oakland high school students to create furniture via a project called GUILD that she says will, “revive Black craft and urban apprenticeship” by building Shaker-inspired tables, benches, hearths and stoneware. GUILD is a collaboration with West Oakland’s City Slicker Farms and will operate out of sites across Oakland, starting with Chinatown and West Oakland. “I am fascinated by the possibility of [creating physical] ground-floor, street-level experiences in Oakland,” Ayofemi said. Ayofemi’s next project, PARK, is set to open in the spring of 2017. It will transform a vacant lot near Eastmont Mall into a multipurpose retail, work and leisure space. Shipping containers from Oakland’s ports will be remodeled into kitchens, beer gardens and workspaces. Peggy Moore, who’s running for the at-large city council seat, announced during her presentation her desire to make Oakland the country’s first “restorative city.” Her vision includes incorporating restoratives justice practices—which focus on conflict resolution and rehabilitation without using punishment—into Oakland institutions and government agencies, through consistent trainings and neighborhood meetings. Oakland schools already routinely use restorative justice methods within the classroom. “I see restorative justice as a fundamental shift in the way we relate to each other, turning from isolation and punishment and toward inclusiveness and healing,” said Moore. The “Solutionaries” panel featured Jose Corona, the city’s Director of Equity and Strategic Partnerships; Chris Chatmon, executive director of the school district’s Office of African American Male Achievement; Deanna VanBuren, architect and founder of Forum Design Studio; and Lance Coleman, digital strategist for ZooLab, a West Oakland non-profit that offers recording studios, offices and apartments, often used for artist-entrepreneur music residencies. “The big elephant in the room is Uber,” said Corona, referring one of the biggest debates in town. Since Uber announced plans to open an Oakland headquarter including mixed retail space, in the historic Sears building in downtown Oakland, community members and business owners have expressed concerns that the move will boost already soaring rent costs and create high-paying tech jobs that are not accessible to all residents, in particular people of color. Corona said he met with Uber’s CEO to communicate the values that he feels matter to Oakland. 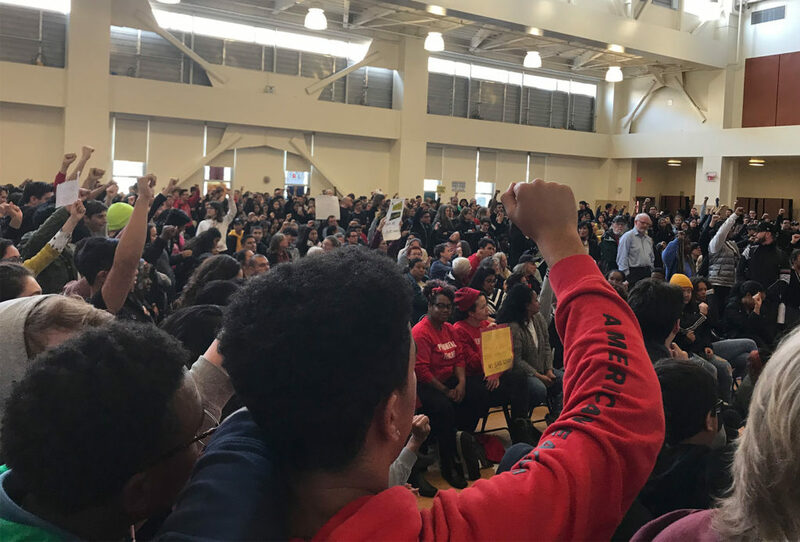 “We care about the diversity of Oakland, we care people of color, we care about the art, non-profit and social justice communities—all we are asking to do is invest in that,” he said. Earlier this month, Oakland Unified School District announced the creation of the African American Girls and Young Women Achievement Program in order to, “give students a place where they can find equitable support and new pathways to success,” according to an OUSD press release. The program comes six years after the creation of a similar program for boys, which Chatmon heads. Ashara Ekundayo, Impact Hub Oakland’s chief creative officer, said that Oakland’s future needs to be inclusive. “We are deeply engaged in dialogue with our own landlord as well as several other real estate developers to explore and ‘call-in’ the community to co-design the future Oakland that provides space for everyone,” Ekundayo said. Correction: On October 5, 2016, an update was added to this story to correct the number of attendees and Pastori-Ng’s job title. Impact Hub Oakland opened during February 2014 on Broadway’s Auto Row in Uptown. More from the “Block by Block” project. The event featured a “Solutionaries” panel. From left to right: featured Jose Corona; Chris Chatmon (OUSD); Deanna VanBuren (Forum Design Studio); Lance Coleman (ZooLabs). Ashara Ekundayo, Impact Hub Oakland’s chief creative officer, welcome attendees to Tuesday night’s event. I’m concerned about the contradictory nature of wanting success but only for certain demographics. Luring high tech then ostracizing the ‘win’? We MUST understand the type of technology that a company like Uber users…Mostly high churn software engineers that they can import depending upon the EXTREMELY short lived skill sets. Software engineers only can expect to have a 5-10 year career. Manufacturing, which is not valued today, such as SEMICONDUCTORS and robot assembly needs to find American roots again. Let’s talk about reviving technology manufacturing, not the churn of software engineering.